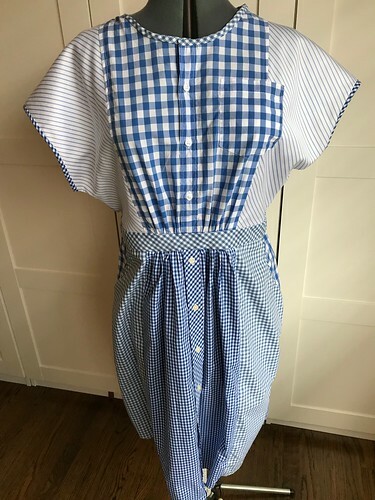 Remember my erstwhile obsession with making shirtdresses out of shirts? 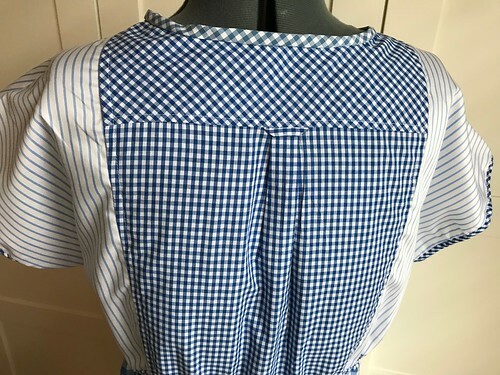 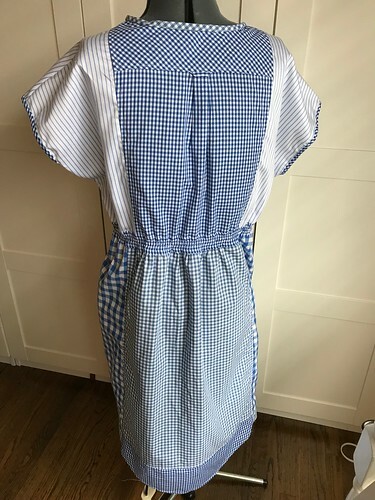 This particular dress is made out of (I think) four men’s shirts of varying gingham and stripe patterns (I tried really hard to find all different ginghams but ended up with the stripes, which I think worked out okay). 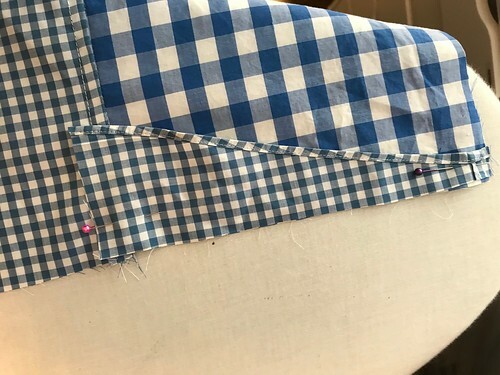 I thought about trying to cut the waistband so that it too would unbutton, but the placket width was slightly off (and I was more than slightly lazy). 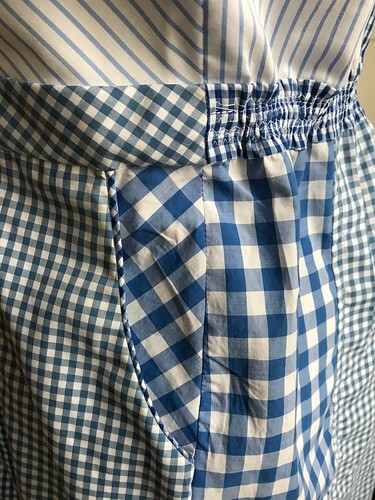 But I remembered to take construction pictures this time! 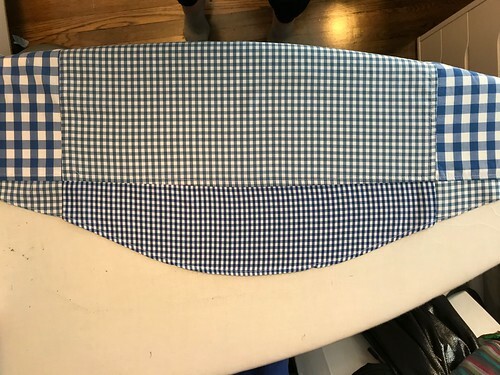 So here’s how I cut out that center front skirt panel from the front of a shirt—I extended the front panel to include the curved hem. 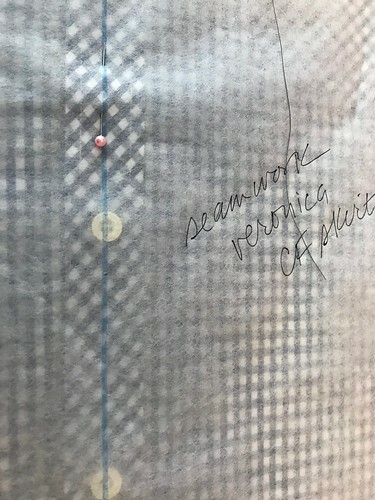 Basically, I created a new pattern piece for the full center front panel (since it’s too hard to put buttons on the fold) and drew a line to mark the CF, which I could then line up over the center of the buttons in the shirt. 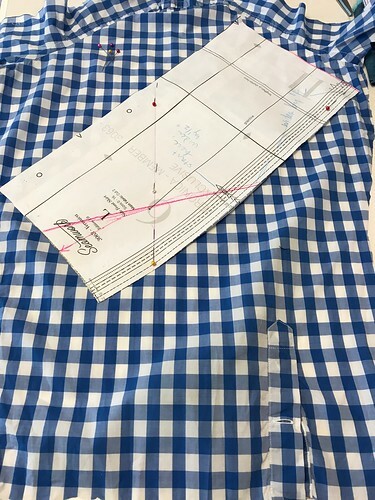 (I did the same for the CF bodice and CB bodice & skirt pieces [not pictured]). 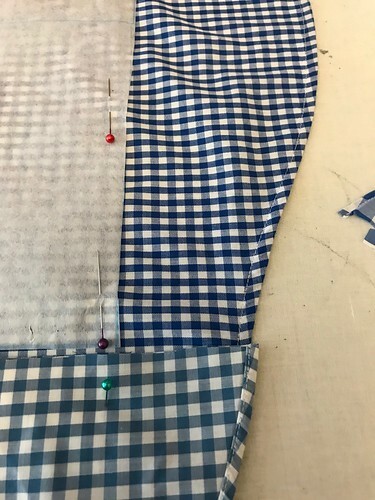 This is right after I resewed the front pocket to overlap the side bodice piece — I usually use washaway tape to hold the pocket in place while I sew, because otherwise things go badly. 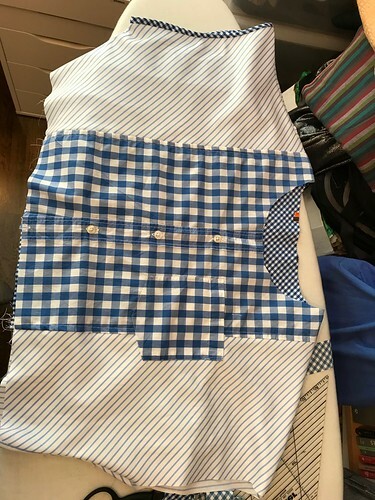 Unless you already have a lot of old men’s shirts lying around, making a shirtdress out of shirts is not that much less expensive than buying yardage (at least not in SF, where a decent shirt at a thrift store will cost you $5-9, depending on condition and whether or not it’s on 50% off sale that day). 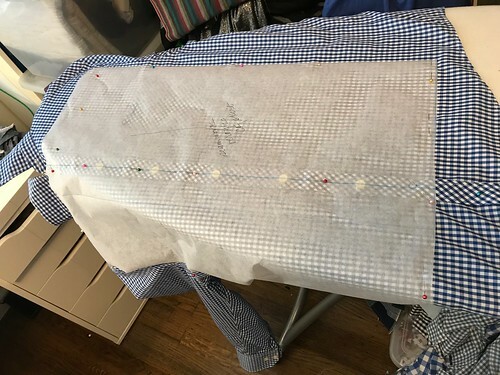 It takes 4-5 L or XL shirts for one dress, and I try to limit myself to shirts that are unwearable as shirts when I can—ones with stained cuffs, frayed collars, or minor holes that I can work around. 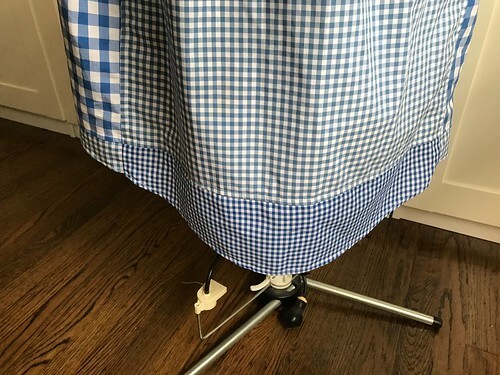 I hear tell there’s a Goodwill warehouse in Burlingame that has a ‘pay-by-the-pound’ sale, but I haven’t gone yet—if you’ve gone, feel free to leave your report in the comments!